Jill is an avid participant in the sport of fencing and even has Olympic aspirations. After she doesn't preform well at a tournament, she is feeling sorry for herself. Even when she finds herself in the Caribbean with her family on vacation, she can't get the thoughts of her last tournament out of her mind. As she is walking on the beach, she comes across part of a mysterious sword and keeps it; surprisingly, this sword holds magical powers and transports her back in time. Jill finds herself on a pirate ship and reluctantly becomes part of the crew. She tries to adapt to pirate life, but ultimately she just wants to get back home somehow and to top it off, she ends up facing the sinister pirate captain. 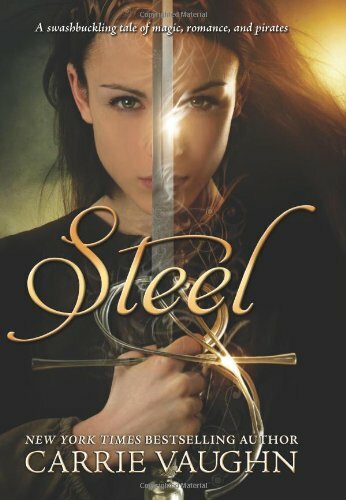 Carrie Vaughn's Steel is a swashbuckling good time! 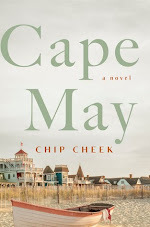 If you are like me, a beach bum or an all-around Caribbean fanatic, you will love the setting of this novel. Jill's adventures take her to the beautiful island of the Bahamas and Jamaica, but what is fun about it is the fact that we are taken back in time to when pirates inhabited those islands. I am also interested in pirates and I'd have to credit one of my favorite Disney rides, Pirates of the Caribbean, for striking my interest as a child as well as Johnny Depp and various pirate themed bars that I've been to. I had a lot of fun reading about Jill's adventure with the pirates and I could easily see Steel being turned into a Disney movie. Jill's adventures are a lot of fun and VERY appropriate for middle school students. I could easily put Steel on my shelf and not think twice, which is peace of mind from a teacher's perspective. However, if you are looking for a lot of romance, this one isn't for you as it is definitely PG. On the other hand, if you are looking for a fun high-seas adventure with a protagonist that is gutsy, then you'll enjoy Steel. I did find myself rolling my eyes at Jill from time to time, because towards the beginning of the novel she was frequently feeling sorry for herself. When she was moping over her recent tournament while on vacation in the Bahamas, I wanted to smack her! Hello! This is the Bahamas! Girl, have a mocktail and forget about it! However, once Jill got past her pity party for one, she became a much more interesting character. Shiver me timbers! (Sorry! You knew I was going to try out my pirate speak at some point!) This book has all the things I enjoy: time travel, the Caribbean, rum, pirates, adventure and a feisty protagonist. If you are looking for an appropriate middle grade novel or an enjoyable adventure, make sure you get your hands on a copy of Carrie Vaughn's Steel. You know what they say..... Time flies when you are having rum fun! 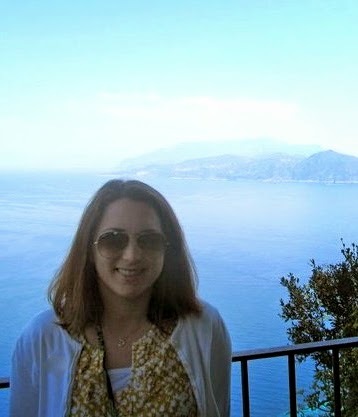 I'm a pirate in person!! I loved the description of this book, but I'm from Brazil, I don't know if I'll find out this book in portuguese. Sounds like a fun read! Pirates are not really my thing but it does sound entertaining. I'm so excited to read this one! Though I love a good romantic element in my stories, this one sounds like it has enough adventure going on to make up for that absence. Nice review Christina! This sounds like a fun read and the setting sounds great! This one sounds great. I'll put it on my tbr list. Great review! This is sitting on my shelf right now because I pre-ordered it and everything and I still haven't read it! I need to read it soon! Great review! Your last paragraph had me totally giggling. Great review.